Buy used. You lose a bunch of value as soon as you drive off the lot in a brand new vehicle. Damnit. Where were you last month with this little tidbit ?? If you want a new truck and you can afford it buy it. It does have tax advantages but its not going to make up the difference between a 50k truck and a 10k truck. Its all subjective. If your new in business and need to build sales volume, tools, equipment, operating capital, establish retirement accts ect.... you should maybe consider buying a 10k truck with no interest or payments. Thats what i did my first 7 years in business. Changed my own oil and did basic maintinance for 5 or so. Lots of people say its a waste of money. So is a lot of things! Boats, clothes whatever, its why we make money to begin with beyond our own sustainablity. people don't need to play golf, or go on hunting and fishing trips, go out to dinner or eat lunch out or drink beer, they don't need Rolex. They want them. Every dude in this thread is from a different situation. One may make 6k a month and have all his **** together and drive a 20 yo truck, one may be the exact same but make 20k a month. A guy may make 20k a month and not have any of his **** together One may be making 3k a month and spending 6k and one may be making 3k and be happier than the dude making 20k! I feel no different about myself, my business or ability to do business at the same level driving a nice shiny 2018 F-250 versus the 2001 Chevy 3/4 ton Workhorse that I started out in. At all. A truck is a truck. Last edited by Jaws; 04-08-2018 at 03:52 PM. Thanks. Very happy with my decision. Yea definitely happy with the purchase. After almost a month have little less than 1000 miles. So I'm using the Nissan a decent amount for work so far. I just looked at the picture again... It looks like the same size as a 1/2 ton. Those smallish trucks are getting pretty decent sized. The Colorado a buddy had was quite a bit smaller than a 1/2 ton. Gonna fight it for as long as I can but I did buy it to drive not sit in the driveway. Having the removable racks that I can throw on in seconds on the frontier has been crucial in a few situations where I needed to run out and get something or when I need a ladder for an estimate or small bullchit jobs I wouldn't send the guys to. 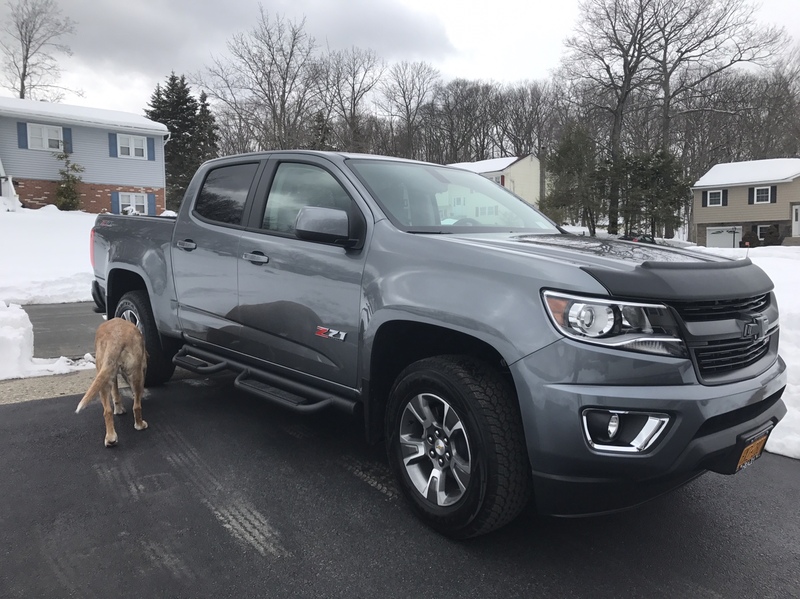 Have the tonneau cover and don't plan on putting removable racks on the Colorado. It's actually a lot bigger than my frontier. The Colorado is way bigger than the first generation ones. Hunter has way more room in the back. I had a mini truck I used around our old house until I traded it for a gator. It had a beastly 3 cylinder in it. Datsun and painted camo.